The Airpura H600 was designed specifically as a economical, yet highly effective particulate filter for allergy and asthma sufferers. Featuring 40 square feet of true medical-grade HEPA filter media, the H600 traps 99.97% of particles 0.3 microns and larger, and roughly 95% of particles down to 0.1 microns, making it ideal for the removal of dust, pet dander, dust mites, pollen, mold spores, and other common allergens and irritants. The HEPA filter features large 1 inch folds (10 pleats per inch) for greater surface area, stronger air flow, and long life. It is warm rolled to reduce cracking at the folds and subsequent air leakage. 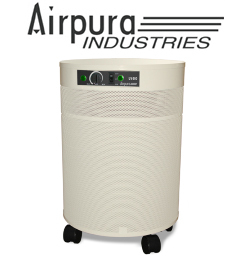 The Airpura H600 also includes a vacuumable pre-filter, and a 306 square inch Hi-C carbon weave filter to offer basic removal of airborne gases, chemicals, and odors. The H600 is equipped with a 560 cubic foot per minute variable-speed fan with a one-piece assembly to reduce vibration and noise, felt gaskets to prevent contaminant bypass (many competitors use rubber seals that off-gas VOCs), and an attractive powder-coated steel mesh housing with 360 degree intake. Recommended Application: The Airpura R600 is an excellent choice for homeowners seeking an economically-priced, quiet, and effective filter to remove common airborne particulates such as dust, dust mites, mold spores, pollen, and pet dander, to relief allergy and asthma symptoms. Airpura H600 is backed by an impressive manufacturer's 5 year parts replacement, and 10 year labor repair warranty.